Matt Crafton, driver of the No. 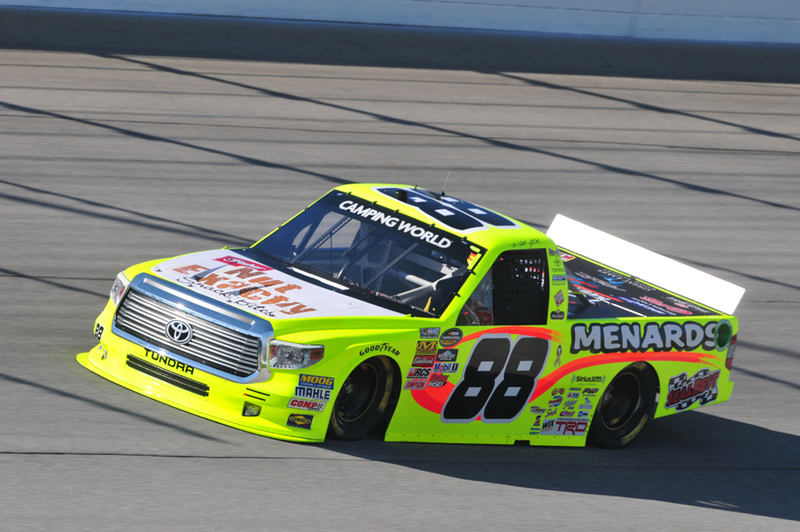 88 Fisher Nuts/Menards Toyota Tundra, made his eighth career start at Chicagoland Speedway in Friday night’s NASCAR Camping World Truck Series (NCWTS) American Ethanol E15 225. Starting 13th, the Menards driver fought handling issues throughout the 150-lap event. Crew chief Carl “Junior” Joiner brought the No. 88 machine to pit road three times, for scheduled stops under caution, at laps 47, 84, and 106, respectively, for four tires, fuel, and adjustments. Running lap times better than the leaders, Crafton made his way inside the top-10 by lap 50, and remained inside the top-10 until the last pit stop of the night at lap 106. A mix of pit strategies forced the Menards driver to restart 11th, with 41 laps remaining. Unfortunately, just four laps later, a multi-truck accident would take Crafton out of the race with damage to the nose of his Menards Toyota Tundra. Although the two-time NCWTS Champion would make the inaugural Chase, he would settle for a 27th-place finish behind race winner, Kyle Busch. What happened in the race? How do you approach the Chase as a two-time NCWTS Champion? The NASCAR Camping World Truck Series (NCWTS) had two practice sessions on Thursday in preparation for Friday night’s American Ethanol E15 225 at Chicagoland Speedway. Matt Crafton was third, and 16th, respectively, in both sessions. Making his eighth NCWTS start at Chicagoland Speedway, Crafton started 13th, ran as high as third, and settled for a 27th-place finish due to damage suffered in a late-race accident on lap 113 of 150. In eight starts at Chicagoland Speedway, Crafton has led the field for 37 laps en route to three top-five, and five top-10 finishes. In 16 starts in 2016, Crafton has one pole (Atlanta), two wins, and has led 421 laps en route to five top-five, and 11 top-10 finishes. In 377 career NCWTS starts, Crafton has earned 12 poles, led 2110 laps en route to 13 wins, 94 top-five and 221 top-10 finishes. Crafton’s ThorSport Racing teammates finished third (Cameron Hayley), 19th (Rico Abreu), and 25th (Ben Rhodes).